Your Web to Print solution is up, running and successful. Now the next step, you want to automate the orders. In steps Enfocus Switch - in this case as a middleware solution. 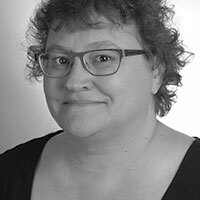 As an example: Andrea Mahoney will use Pageflex metadata to automate Switch workflows dealing with digital, offset, wide format, spot colors and outsourced items. She will cover database integration, preflight before data-merge using Pitstop Server and other nice workflow tricks. Andrea Mahoney is an Information Systems graduate with a database programming background. She joined the graphic arts industry in 1990. Her work with graphic arts resellers and her production experience in packaging, specialty print, book publishing and commercial printing has provided the foundation to use technology to automate manufacturing. In 2005 she started TriBay, a workflow integration company that quickly evolved upon her discovery of new automation tools like Switch. She specializes in automating workflows for print production, bindery and fulfillment along with integration for online systems and MIS.